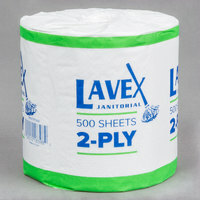 Ensure your restrooms are constantly stocked with this Lavex Janitorial 2-ply individually-wrapped toilet paper! These individually-wrapped toilet paper rolls enable you to stock-up on extra rolls and conveniently store them in restroom stalls or on countertops. These handy locations ensure guests never run out of toilet paper! Plus, the individual wrappers completely protect the rolls and ensure they provide your guests with sanitary cleaning. The roll's double-layered design enables patrons to use less toilet paper per bathroom visit, saving you money on additional rolls! Meanwhile, the white colored paper provides patrons with a clean and fresh feel. Uses for my hunting camp and it works really good when we all that chili and stuff that bubble makes hahaha but it does work very very well. This toilet paper has worked very well in my new account that our company services 3 times a week. Very inexpensive and customer is pleased with the quality! I will continue to order this product!! Out of all the lavex toilet papers this is the best one. It is much softer than the others. I wish they would make it in a bigger roll. This is by far the most economical 2 ply toilet tissue out there. The fact that it is individually wrapped for sanitation is a big plus. Toilet paper is the worst math i have ever dealt with, not sure if these are cheaper then the less expensive ones, but they cost less then the other stores with shipping so i'm good using them here and home. This toilet paper is very good and they give a lot of paper for one roll. It is a great price also and would for sure order again for my hotel. Very good quality toilet paper for the low cost. I really like that they come individually wrapped and they, so far, seem to last quute a while. Sturdy yet soft enough that they do not irritate. Individual wrapping means they are more sanitary when being stored before use, price point is good for large volume usage. These toilet are good for the price and for the amount you get. The only thing i wish for is, i wish it was a little stronger/ thicker. But overall it's a good product if your looking for something cheaper. For the price of this toilet paper I definitely can’t complain. Basic toilet paper not super thin. Perfect for keeping the bathrooms in our restaurant stocked. Good price for what it is, but if you have finicky toilet paper holders like we do, people end up tearing off the ends of the paper without getting it to roll properly and then there's a mess of paper ends on the floor. But for the price, I didn't expect thicker paper. I just need to upgrade my toilet paper holders to something that will roll easier and these will work fine. This lavex toilet paper in the green wrap is okay. Its thin but doesnt leave lint behind. Since it is thin we go through it faster but, it is a decent quality. I'd like to try the other color wrappers and see how they compare. Worth trying out. Great value for this lavex janitorial 2 ply toilet paper. It is thin but it gets the job done with no left over lint. Even though it is thin it is pretty strong. I recommend this to anyone looking for a budget friendly tp. Decent toilet paper for the really affordable price. These toilet paper rolls won't be as luxurious as many other 2-ply rolls but it is still a big step above 1-ply. Great quality. I like this product is very affordable and durable. I use this product at home also. Definitely recommend this product, if you are looking for toile paper this brand ia great. I recommend this product. It was the cheapest option I could find and yet it has good quality and it does it's job! It is worth the price. I like this bath tissue because of the way that it is packaged and due to how soft it is. The rolls do look a little small for a 500 sheet roll, but the toilet paper has an excellent quality and value. 2-ply toilet paper is still easy to flush and will not clog toilets. Our customers like the 2ply over the 1 ply and the price is a great deal. Good quality toilet tissue! We have tried several 2-Ply toilet papers and this product is comparable at an affordable rate. We use this product on all our commercial properties. This Lavex janitorial 2 ply toilet paper is nice. Its a good value. It is thin but for the cost it is worth it i will try the pink one next time because it looks thicker, but a good thing about this one is it has very little fuzz left over. For the given price very fare quality. They run out fast since its a short roll, will need to order a bigger one for a public restroom. I like that the toilet paper rolls are wrapped individually. They are 2 ply so and they dont flake or fall apart like most brands. Would recommend this to anyone looking to save money without skimping on quality. We have saved a lot of money per month just by switching our toilet paper. Lavex is now our go to choice for "off - brand" products while providing peace of mind we are getting the same quality as "premium" choices. Not a single employee can tell a difference that we switched, except the accountant. These rolls are perfect for restaurants use. They are the right size and the right amount of not too much and not too thin. Good quality. Honestly, this stuff was pretty thin and not very absorbent. I usually love all my purchases from here, but I won't be buying this one again. This seems to be a better quality than I have gotten in the past. Not sure if they improved their product or I received a different product. Can't go wrong for the price. Good mid grade 2 ply toilet paper. soft and comfortable, reasonably priced toilet paper. What more can one ask for more when you run a theatre? the rolls last longer than the standard rolls you purchase at the supermarket thus saving space in our venue. Great bang for your buck. I would recommend to anyone. its a good quality product. You get quantity and quality for a very competitive price. These toilet paper rolls are just ok. They are very thin and they are very cheap. The plus side of them are that they are very value friendly. You end up probably using the way too much of this product at a time, so it might just be better to spend the extra money and buy the better ones. We tried this 2 ply paper after buying the 1 ply paper. It is definitely an upgrade. The price for the case is also great compare to others out there. Great quality product. This 2 ply toilet paper by Lavex Janitorial is a great value. Of course it's thin and pretty cheap but for the price it's pretty good. Individually wrapped for cleanliness and convenience. Horrible! This stuff is pure CRAP and yes, I know it's ironic to use that description when talking about toilet paper, but that's the nicest way I could think to describe this product. Wow - I would be mortified to put this in any bathroom - guest OR employee. I will say that it's quite impressive that it actually is 2-ply. What's impressive is how they managed to actually produce layers that thin! This is barely the thickness of 1-ply regular TP that you would but anywhere else. Where some reviewers said "well, for the money..." What are you kidding me? If it were $1.00 a roll it'd be overpriced. I guess it can be used as packing material, but more than likely my order will be lining the inside of the garbage bins. Total waste of money. Thank you for the review Eric. We’re sorry this has not worked well for you. For an alternative that might better meet your needs, try this Lavex Janitorial 4 1/2" x 3 1/2" Premium Individually-Wrapped 2-Ply Standard 500 Sheet Toilet Paper Roll - 24/Pack instead! This item is a Great Buy! Compared to other stores and companies selling to restaurants, this is an okay find. The quality is alright. The product is as advertised. It works well for my agency. However, I have not recommended this product to other companies. I found that I go through far less toilet paper with this product. I've saved at least 30% even after currency conversions and shipping. No complaints from customers also. This is a great deal for a large quantity of toilet paper. It is just as good as any other, and we love the price! For the price it is okay. But I got it for my employees and they deserve better. The 2-ply isn’t really enough. It’s rough. I will be buying different toilet paper. Love the quality and price of the Lavex Janitorial individually wrapped 2 ply standard toilet paper roll. Great paper for our business restrooms and we love it. The Lavex individually wrapped toilet paper is great for hotels. The tissues is a great quality and perfect for dispersing in every guest room. The price is wonderful. The value of this product is incredible! I also like the quality of the paper and it’s tickness. The paper is very soft and every roll is enwrapped. This is the best product anyone could ever use. i always use this product and it last a very long time. This product is amazing. Purchased for the first time Lavex product and I am very satisfied with the quality and fast shipping. Very well packed in extra plastic to keep moisture out. Excellent value and a great quality toilet paper for the price. When you have as many toilets as I have to run after, you need products like this to cut costs! We put these in all the Children's Ministry bathrooms. Great size for them and they are nice and heavy too! Came well packaged in a 24 set. We set the entire packaging in our closet. This reminds me of the old toilet without that 'new' fluff that leaves LINT everywhere. NO lint from these! Thanks again, Webstaruant! Will be purchasing several more. These are the cheapest 2 ply! Basically disintegrate when you touch them....I wish I hadn’t bought these we were stuck with them for a month! Thank you for your feedback, Laura! We are sorry this toilet paper did not meet your expectations; for recommendations please contact our Customer Solutions team! The twenty-four pack of Lavex Janitorial Individually Wrapped 2-Ply Standard five hundred sheet Toilet Paper Roll really comes in handy for large events, and definitely cost efficient. The size, weight, sustainability and strength of the rolls are unmatched, especially compared use to use against the other brands I have tried. They are resilient and clean very well- I would recommend. This lavex toilet paper works great. It's a little on the thin side though. It's a 2 ply standard 500 sheet. The case came with 96 individual rolled toilet paper. Great toilet paper. Not the cheap stuff! This is like commercial grade Charmin. We won’t use anything else and I’m sure our customers appreciate the cushion. Not bad for the price. Still believe the product could use a better production process. Reall thin and easily breakable. Still would recommend simply beacause of the price. This toilet tissue is a great value for the price. It is very comparable to a major brand. It is soft and lasts and is great with the plumbing. This product is exactly as described and has worked well for us. We use it in all of our restaurant restrooms and we do not receive complaints and we have no issues with clogging. A pretty good toilet paper roll .The rolls are individually wrapped which I love that feature. The toilet papers is average strength and about average softness. It is just a good decent toilet paper great for your office restrooms. Lavex Janitorial Individually-Wrapped 2-Ply Standard 500 Sheet Toilet Paper Roll - 96/Case I ordered this as a backup to by roll dispensers. just in case I forgot to reorder. Why overpay at the supermarket when you can get standard, good quality, two ply toilet paper on this website. Definitely feels nice on the bum and I will buy again. What can i really say? It is toilet paper! Anyway, this toilet paper gets the job done. Is it the softest? No.Is it the strongest? No. Is it even the cheapest? No. But it works well for the price and does what I expect it to. If i hated it I would buy it! whats better than toilet paper? the quality vs price. these toilet papers are winners of bot sides. great price for what you get in a case and great quality. Thin paper but does the job. You do have to use more than other brands so you do go through it pretty quickly although it seems like a lot. Well it's toilet paper what can I say. It is your basic roll. It is easy to use and comes in handy for anyone who needs it. This toilet paper is great for commercial use but is not of the brands for home and family use since the paper is very thin and takes double for regular use. This toiler paper is an excellent choice. You don't have to worry about tearing or high cost when you purchase these in bulk, which is really helpful! This is good toilet paper at a great price. 96 rolls really goes a long way. A little stiff and thin but really hard to complain considering the price. Would definitely recommend if you are trying to find a good solution for a bathroom that isn't in your home. I gave this 5 stars for the great value ! This is a septic safe grade toilet paper not real thick but adequate the price can't be beat. This is a high quality toilet paper. Yes it is classified as standard but it is a sturdy paper that is economical. We will definitely be repurchasing this product in the future! Love this toilet paper. It reminds me of Scott but at a cheaper price. Will be buying this monthly now. Very good quality happy I flounder this here. this towel absorbs a bit better, but still not the best when it comes to large spills or a quick absorbent. would purchase alternative brand! This toilet paper is similar to the toilet paper you would use in your own home. Nice and soft and doesn't tear of in single pieces. Good quaiity product. Purchasing tissue on line was a sensitive topic. Reading reviews previously written helped us take that leap of faith. We were very pleased with the packaging as they are individually wrapped. The tissue is softer than expected and the price is great! This toilet paper last a long time. Its package well and great on your septic tank. Soft not rough and it dissolves in the water quickly. As far as purchasing bulk toilet paper goes, this option is a winner. It comes neatly packaged and individually wrapped, perfect for the office atmosphere. This is a 24 pack of toilet paper that will surely last you the time you need it for. I am picky about the strength and softness of toilet paper. I mean who likes to use something that feels like it's directly from the woods¿ this is 2 ply and surprisingly soft. Love these rolls of toilet paper! Completely worth it to spend the little extra and get the 2ply over the 1ply plus members love it more! Is decent quality most of the time, it from here to there we occasionally get a roll that feels thin and isn't very comfortable whilst in use. I was looking for a better priced product compared to what we were currently using and thought I would give this a try. I was very disappointed with the quality. It is very thin and leaves pieces behind. I will not be purchasing this in the future. I like that they are individually wrapped to protect from dust. I've used them to go camping and they did the job. It is priced great for such a large amount. I really don't like this toilet paper. The texture is weird. The plys peel apart. The packaging is nice with it being individually wrapped. I will look for something different next time. Great quality, soft and thick and great price. It lasts quite long as we have a very busy establishment with a very busy restroom. Fits our dispenser perfectly. I love how the tissue is individual wrapped so I can take it anywhere without getting dust over it. I also like it because it does the job what it suppose to do without hurting your bank. There's not too much to say about this toilet paper other than it gets the job done. I don't believe in spending a lot of money on things that I'm just going to flush down the toilet, but this Lavex 24 pack meets my budget needs. For the price this is a great toilet paper. Nothing fancy but it has a larger roll and it gets the job done. We used the two bay dispenser and don't have to refill them often. This toilet paper is very thin. I was asked by my employees not to reorder. They said it is was not very good quality toilet paper. This was the best value when I needed TP for our hotel. The number per case and the good quality paper was what made me decide to order this product. This toilet paper is just ok, pretty thin and shreds too easily. I probably won't buy this brand again, but it's not terrible either, average at best. So economical makes this an easy choice for shops, and factories! Love this product because for what you pay the quality is great. Individual wrapping makes it easy to store and keep! I purchased this tissue for my huge family. I was tired of the expensive leading brand so I decided to try a different brand. Glad to say this tissue is great!! This TP is pretty soft and it does what it's supposed to do. The price is unbeatable and I won't worry about running out for a while. I like that each roll is individually wrapped -- definitely more sanitary and a must if buying in volume. Even though the paper isn't a commercial brand, it gets the job done. This paper last for a long time even though the paper is not as thick as some others. Great value. Good toilet paper. Not sure with the shipping it pays to get these but not quite as not as some of the thicket papers. Would recommend. You can also use the Lavex Janitorial Individually-Wrapped 2-Ply 500 Sheet Toilet Paper Roll to make a band-aid. The tissue is flimsy but it will get the job done. After paying the price and receiving the quantity that you get, it is a great value for the money. I'm glad with the purchase. Also fast shipping. Not very happy with this product. Thought the quality would be better since it is 2 Ply, but it doesn't feel at all like 2ply. I never liked thin toilet papers when I would go to other restaurants, and it's the small details that make a guest have a fully good experience with their visit. We use this toilet paper in our store and it is fantastic. It is at a great value for the quantity you receive. The only problem is that sometimes it tears too easily and it's hard to start a roll. I have been buying this brand of toilet paper for my vacation rental, and I have to say I am very satisfied! Great value for the price! Will buy again for sure! The paper itself is fine but there were a few rolls in which it was hard to start the roll, I experienced tearing and it seemed the plys wanted to separate, that took extra time and made for a bit of frustration. Pretty basic commercial toilet paper. Seems to have a nicer texture and a little softer than other commercial brands. Big fan, will definitely keep using this in the business. This toilet paper may feel a little thin but it is actually pretty good quality. I found that the use is about the same as that of some other fancy named paper. The price is also really great so i would definitely recommend this product and I love it so much me and my wife. We have purchased this item several times. It is a great price for the quantity, but a two ply is probably a better purchase. Will order again. This toilet paper may feel a little thin but it is actually pretty good quality. I found that the use is about the same as that of some other fancy named paper. The price is also really great so i would definitely recommend this product! I will not be purchasing this again. I should have paid better attention before ordering. It is made in China and I was disappointed with this purchase. I bought these in 2010 as a cheaper alternative to Scott for my daughter's wedding, and they were very satisfactory. i felt I got excellent value for the money. Thank you for your review! We're sorry to hear you didn't like your toilet paper. Take a look at our Good, Better, Best quality ratings on the right hand side of your screen to find higher quality items. We also sell smaller quantities of toilet paper if you would like to try it before you buy a case, Daisy Toilet Paper – 24 / Pack. For the cost they are very good. They are a good low cost option that we use for our coffee shop operation. We like that they are individually wrapped. Large amount for the price. However, paper seems very cheap and rough. In the end, the savings are not as good because you have to use more to get the job done. Thank you for your review! We're sorry to hear that the toilet paper didn't meet your needs. For a more heavy duty toilet paper, try this VonDrehle 2-Ply Toilet Paper instead. what a great value here with the 96 rolls per case. like I said its a value product. meaning for the cost its great. if you want super soft nice stuff spend more. but this is a great value product. The softness of the Daisy toilet paper rates right up there with Charmin or Angelsoft for just a fraction of the price. The cardboard core is strong enough that the rolls do not get squished in transit or storage. Great quality for the price. This is much better than TP you might find in many retail establishments. Let's face it, this isn't super cushy premium paper, but the texture is nice and it's not scratchy at all. We will purchase again! This toilet paper is a good value for the price. It's not deluxe but it does the job. I think 2 ply is the cheapest I would go. strong paper, holds the liquid perfect dont cross to the nex ply, last for a long period of time, and have a nice quality style. Great value paper, ideal for a high traffic public restroom. Key word is value. The quality of the paper is not fantastic, but not the worse. I will keep on buying it. I have used both these and the 1-ply version of this toilet paper for my San Jamar single toilet paper dispenser and I would probably have to recommend this option because it just works better. I also feel like 2 ply toilet paper has the appearance being higher quality. Find yourself going through a lot of toilet paper? Invest in this large case of strong toilet paper and save money. Very soft and easy to use with standard dispensers. Good product i use this daisy two ply toilet paper at home and at work. It is a great product for both places. I love the price and it comes in packs of twenty-four. The Daisy 2 Ply Tolit Paper sold 96 Rolls per Case 500 Sheets per Roll. It is not as soft as i thought it should be. But the price was great. very good 2 ply Daisy toilet paper. we bought this a few months ago and still have plenty. Very good and it is well priced! This toilet paper was terrible. Very thin and not useable in a commercial environment unless you need to go real cheap. Customers could not pull the roll without the sheets tearing. Sorry but would not recommend. Thanks for your review! This is one of our lowest costing rolls, making it a great economy buy. You should check out our Good / Better / Best ranking on this item's page for toilet paper. You will be able to find some of the higher quality rolls we offer like the 2-Ply Toilet Paper Premium 96/CS. We all know what we pay for toilet paper at other plases.This is good quality and a great price.I will be ordering more when needed. This is quality toilet paper for a great price. It is comparable to the toilet paper used in many establishments. If a premium look and feel are desired then you may want to check out another option we offer like the the 2-Ply Toilet Paper Premium 96 / CS. Great toilet paper, the roll is not too thin and fits perfectly in out toilet paper dispensers, which we've had a hard time finding one that would fit. This one is perfect and doesn't fall apart easily. This toilet paper is a good price and good for a business. The only trouble is that the tear line of the toilet paper is not that precise. Other than that, they're great! Bargain Toilet Paper at the price, I have not benn able to find toilet paper any cheaper than this. a little thin but still good value. An economical choice for toilet paper. This is a thin 2-ply. It can be difficult to start the roll, thus causing waste, but once you get started, it is fine. Nice 2-ply toilet paper! Great for home use, great price! Cheap in price but not in quality! Sure to please any customer! Soft to the touch!!! good value for the price. haven't had any customers complain and seems to hold up well. Not the softest, but not sandpaper either. value buy. This toilet paper is very cheap, and quality is also cheap. I did not like and I will not be using them not even for the customers. I wont be ordering this again. 5 stars! This is so economical to use and the softness is not the greatest, but for the price is better than expected. We will continue to use this unless it is discontinued. So keep it for everyone! I've actually gotten comments on this toilet paper! People told me it's better than a lot of other places they've been too. The only problem I have is that the cardboard roll needs to be a little wider. One case has lasted me over 3 months! This 2-ply toilet paper is almost 20% cheaper than the comparable toilet paper we are currently purchasing. When ordering an economy brand, this is a bargain. The toilet paper gets the job done, and is at a great price! The only issue with the product is that it is a little rough around the edges.